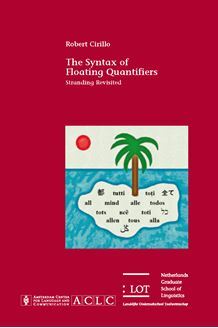 This book is about floating quantifiers, or quantifiers that “float away” from the phrase that they modify, as in “The children are all sleeping” vs. “All the children are sleeping.” In this thesis the debate is reopened on whether floating quantifiers are adverbials or stranded nominals. It is argued that if the Stranding Analysis is updated for innovations such as the Split VP Hypothesis some of its most serious weaknesses disappear. It is also argued that if the Stranding Analysis is evaluated in light of much more empirical data than have been heretofore considered, involving a wider range of syntactic structures in a larger number of languages, it proves to have at least as much explanatory power as the adverbial approach. This thesis also offers a theory of negated floating quantifiers such as not all in The students have not all read the book and explains why negated quantifiers can be floated in the Germanic but not in the Romance languages and why inverse scope (Neg > Q) is possible in the Germanic languages in a sentence like All the students have not read the book but not in the Romance languages. Finally, this thesis presents an original theory of floating universal numeric quantifiers such as the English all three in The students have all three arrived. This study is interesting for anyone working on quantification, floating quantifiers, sentential and constituent negation, the lexicon­syntax interface, comparative Germanic and Romance syntax, or Japanese floating numeral quantifiers.